"And though the artist must remain the master of his craft, the surface, at times raised to the highest pitch of liveliness, should transmit to the beholder the sensation which possessed the artist." Alfred Sisley is one of Impressionism's most unjustly overlooked artists. This may perhaps be due to the fact that Sisley straddled two different cultures, having been born to English parents in France and later dividing his time between the two countries. As such, though he worked as one of the key figures in French Impressionism, he remained something of an outsider. Unlike many of his peers, who examined urban life, industrialization, and people, Sisley was almost exclusively a painter of landscapes, a subject from which he rarely strayed. What's more, there is a moodiness and distinct colorism in his works that suggest an influence from earlier periods of English and French art, especially the Barbizon school. As such, Sisley created his own unique brand of Impressionism that foreshadowed many of the new painting styles that would emerge in Europe after the turn of the 20th century. Sisley's landscapes are known for their uncanny ability to capture a sense of atmosphere and light. This effect is compounded by his big, expressive skies, which are almost always a central feature of his paintings. Although he is often considered an outsider because of his English citizenship, Sisley trained in Paris with Pierre-Auguste Renoir and Claude Monet, among other greats, and was one of the crucial figures working to create the new style that would become known as Impressionism. Although Sisley's works are quite beautiful to the modern eye, it is important to remember that his work (like that of all of the Impressionists) was quite radical in its own day. His focus on modern, urban life, his view of nature as a worthwhile subject matter, and his sketchy, "impressionistic" style were all hallmarks of a new painting style for an industrialized world. Sisley's sensitivity to the subtleties of natural landscapes was striking, allowing him to create landscapes that pulse simultaneously with the seemingly contradictory feelings of physical realism and dreamy emotionalism. 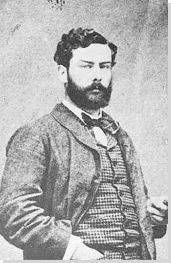 Alfred Sisley was born in Paris, the son of affluent British expatriates. 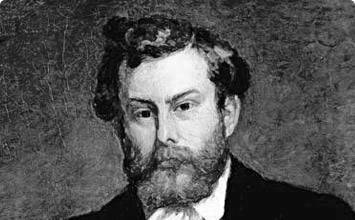 His mother, Felicia Sell, was a music connoisseur, and his father, William Sisley, owned a lucrative business exporting artificial flowers and silk. Felicia and William were cousins, descended from a long line of English smugglers and tradesmen. Alfred was one of four children, one of whom - the eldest brother - died at a young age. Unfortunately, little is known about Alfred's adolescence before he was sent to London in 1857 to study for a career in commerce. While in London, Sisley is said to have spent much of his time visiting the exhibitions of John Constable and J.M.W. Turner at the National Gallery. This monumental landscape was exhibited at the Salon of 1868. Avenue of Chestnut Trees Near La Celle-Saint-Cloud illustrates a hunting trail leading through a heavily shaded forest close to the village of La Celle. Sisley painted this subject two times before, in 1865. This painting's subject matter and intense color are reminiscent of the Barbizon school. In fact, the painting has been compared to Hobbema, Rousseau, Corot and Daubigny. Avenue of Chestnut Trees Near La Celle-Saint-Cloud is an example of Sisley's early work, which is known for the use of soft brushstrokes. His ability to represent the intense colors of the forest is achieved through the layering of green and gray tones. The deer standing to the right of the path may suggest a royal subject. Footbridge at Argenteuil (1872) is a landscape painting that captures modern life at the end of the 19th century. The subject matter is not typical of Sisley's oeuvre, yet the painting is stylistically representative of his work. Footbridge at Argenteuil is inspired by contemporary Japanese prints, in which, as here, the picture plane is the main focus of the composition. This is evident in the bridge, which dominates the canvas and flattens out the composition through the use of diagonal lines which evoke sharp, fast movement and thereby mimic the speed of modern day life. Additionally, the foreground is pushed forward and the canvas is cropped, which creates a similar sense of spontaneity of a photograph. The harmonious balance of muted dark and light colors allows the eye to move quickly across the canvas, giving the illusion of movement. The Bridge at Villeneuve-la-Garenne (1872) represents an Impressionist landscape along the Riverbank of the Seine. This painting is emblematic of Alfred Sisley's oeuvre, concentrating on the artist's perception of the natural world. The application of quick, feathery brushstrokes captures the ephemeral effects of light on a surface. This can be seen with the subtle nuances of color on the river that reflect the sky, clouds, and grassy knoll. The perspective from which the artist chose to paint the bridge gives a sense of the structure's monumental scale. Additionally, Sisley included figures to provide a sense of scale to convey the bridge's size. The River Loing at Saint-Mammès (1885) represents a port where the Loing and Siene Rivers meet. Sisley painted this subject several times while living in Les Sablons. The painting's lack of shadows and intense, warm colors suggest that it is a summer afternoon. Sisley methodically breaks the canvas into four horizontal planes, the grassy knoll, the river, the beach, and the sky. He paints the grassy knoll with curving diagonal brushstrokes, which flows seamlessly into the river, distinguished by short horizontal brushstrokes. The flat cream color of the beach divides the sand from the river with long horizontal painterly lines. Sisley used the sky to create a harmonious balance of color, unifying the composition. The whites, reds, purples and blues making up the clouds are reflected into the water. Additionally, the red roof tops of the beachfront homes are reflected in the river. This color scheme is also employed in the boats and the Paris-Lyons railway viaduct in the distance. This work represents an open field of grain outlined by poplar trees. The Four haystacks create a diagonal line through the canvas, giving depth to the composition as they recede into the background. The massive landscape includes a peasant working in the field to illustrate the monumental scale of the haystacks. Poplar trees frame the background, additionally emphasizing the vastness of nature. Sisley captures the light reflecting off of the grain with deep oranges and reds through the thick layering of paint. His brushstrokes are almost whimsical, giving the grain texture. Haystacks at Moret, Morning represents France as a fertile, agrarian country, bountiful in its resources. The poplars were a National symbol, often represented in the iconography of France. Sisley's painting represents the Church of Notre Dame at Moret-sur-Loing, seen from the West Portal entrance. He painted this church about a dozen times after settling in Moret in 1889. It is considered a series, although it is unknown if it was meant to be exhibited that way. The architecture encompasses the entire canvas, translating the heaviness of the stone structure. Sisley emphasizes the solidness of the church with thick painterly horizontal lines, but his loose brushwork and ability to capture the quality of moving light and shadow lightens up the whole work. The painting represents the church during the late afternoon, when the sun was setting on the church. This makes for a glowing composition, with vibrant golds, oranges, and browns set off against a clear blue sky.